Birders have lots of "special" birds. Spark birds are fondly remembered as igniting our interest in birds. Life birds are big in our world for being the first of the species we are privileged to see. We have our year birds, state birds, county birds, or even "photo" birds to declare as they make their way onto whatever lists we may keep. There are birds we need (as in, "Dang- there's an Ivory Gull in South Dakota. I need that!") 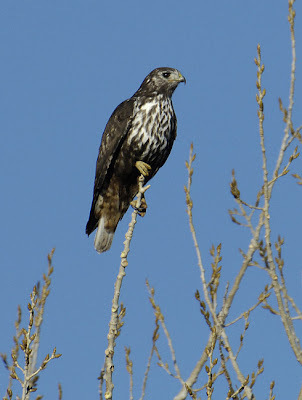 Some birders may even have their favorite bird, although when I'm asked about mine I can never think of a single one. Then there's the nemesis bird (or birds.) Nemesis birds are species we need for one of our important lists, but manage to repeatedly dip on (read: "miss") despite reasonable efforts and likelihoods of seeing said bird. To reach nemesis status, a particular bird will disappoint multiple times, often missed by bare minutes or less after plenty of other birders have succeeded on the same chase. I've said it before, but it bears repeating that the worst words a birder can hear are, "you should have been here ____ (minutes, days, or whatever) ago." Anyway, I only have 5 lists that I really pay attention to for now- my Life, ABA-area (almost the same as my Life List) Photo, Colorado, and Boulder County Lists. I fool around with a yard list, too, but since my yard isn't great for bird diversity I don't get too worked up over it. Anyway, the easiest bird left on my Colorado list was one that gave me a heck of a time until last weekend when I finally shook hands with it in Cañon City, Colorado. I was down for a Colorado Field Ornithologists meeting, which was held at the venue of our upcoming convention 16-18 May. Before the meeting, Mark Peterson (CFO board member and convention field trip coordinator) squired a few of us around to seek out some good birds that were in the area. 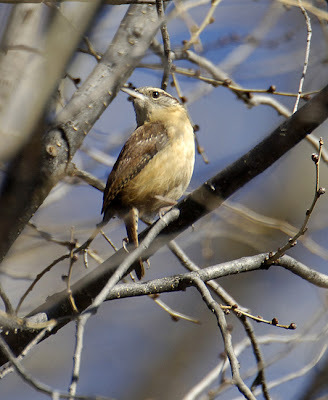 One was my state nemesis bird, a Carolina Wren. When I'm out of the state, I have no trouble seeing and hearing these birds. But in Colorado, they have tormented me with near miss after near miss. For example, a few years ago I missed a singing bird in the northeast part of the state by about 5 minutes, but by the time I showed up it had shut up, not to be seen or heard again for the half-hour or so I tried for it. I missed another in Boulder County on a mid-winter trip I was leading with Ted Floyd- he had it at the front of the group but by the time I caught up it had gone to ground. Double-ouch!! (Missed it for the state and the only county I list in!!) My best bet became Cañon City, which isn't too far and has hosted a territorial male (and perhaps a breeding pair) for a few years now. The first time I went there I had detailed fresh info on the bird's location, got to just the right stretch of the Arkansas River, but had no success. Perhaps the constant gale-force winds had something to do with it. Then, on a new-year's trip to the same spot this past January, I met some of my pals who had just had the bird. Did I get it, within the hour of them? Of course not- that's how nemesis birds work! Anyway, the third time there was a charm, and as we were getting close to the territory we heard it break into song. Shazzam! Walking up, we had nice looks, too, although in Carolina Wren form it kept in branchy cover. So now that Mr. Carolina finally has lost his nemesis status, it is time to work on another one. 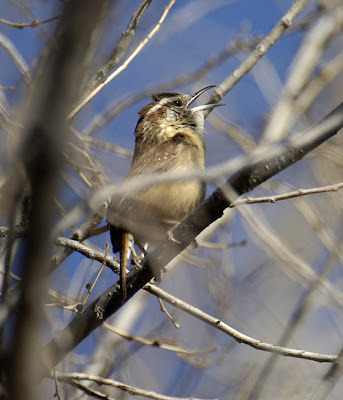 I don't have a current contender, but a dip or two more on something like American Woodcock or Yellow-throated Vireo could elevate either to my current Colorado nemesis bird. The Valmont Great Horned Owls are seemingly doing well- I surmise by last night's activity that the female is being kept well-fed by the male. 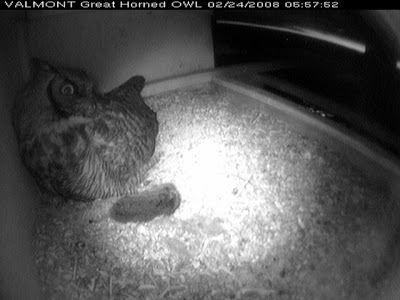 He delivered a plump vole at 8:37 last night, and she didn't just gulp it down right away. Instead, she saved it for most of the night, not eating it until dawn was lighting up the sky at about 6 am. She takes short breaks throughout the night, maybe to sit out on the perch or maybe to stretch her wings a little, but none seem to exceed an hour. Last year, she would leave for hours on end, even in bitterly cold weather, and the first clutch failed. After the eggs were removed, however, she laid more and pulled off a successful, if not late batch of chicks. Perhaps with a year of experience under her belt everything is on track this year. Not all of the local Great Horneds are on eggs yet, though. I was at the local Wild Bird Center today, and ran into Wendy Stuart, an outstanding bird photographer who has been watching her favorite pair at Walden Ponds Wildlife Habitat in Boulder all spring. The female there is staying near the nest but not incubating yet. 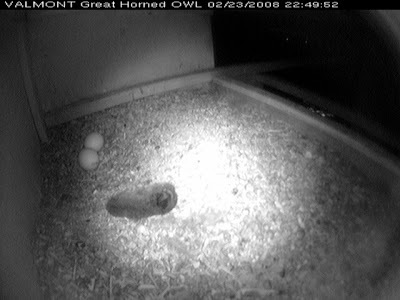 Guess there's room for variability in this area depending on the owl in question- Wendy says this pair has laid eggs in March every year she has studied them, this being the fifth. Let the owl-camming commence! 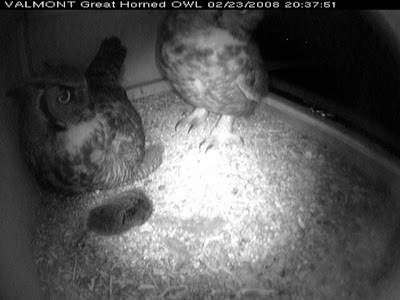 I haven't been watching the Valmont Power Plant Owl Cam too closely, but the last time I checked (about a week ago), an Owl had been coming and going but I figured there would be a bit of a wait for incubation, since the Great Horned Owls there laid eggs February 24 and 28th last year. 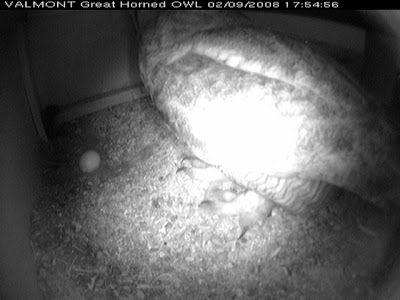 The owl abandoned those eggs for some reason, but had another clutch going by March 24 with chicks still in the box in early June. 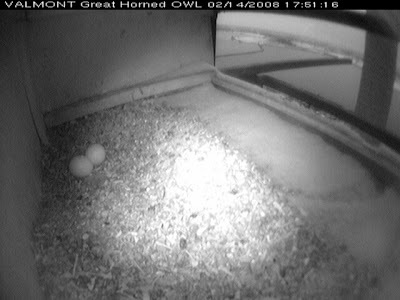 Now I see that there was an egg already laid this year on February 9, and two are there now, with the female spending most of her time incubating. 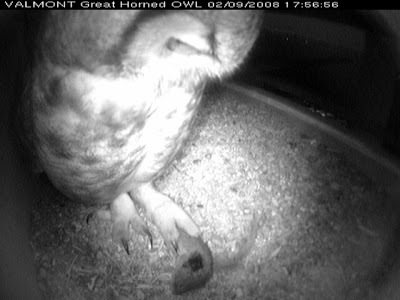 Papa owl is bringing treats now and then, too- check out the vole (or whatever it is) in the second pic below. All good news- I hope they succeed at their first try this year.. Many of you already know about this cam, but if not you'll find it interesting to know that the nesting box is 260 feet up the side of a retired smoke stack at Xcel Energy's Valmont Station in Boulder, Colorado. The stack overlooks the Valmont Reservoir complex (see above), an Important Bird Area especially known for the wintering waterbirds there that take advantage of the open water created by the warm water discharge of the power plant. The box was placed to attract nesting Peregrine Falcons but has had Great Horned Owls use it for years now instead. On the annual Boulder Bird Club mid-winter trip to the reservoir complex, plant engineer Dave Madonna described the difficult efforts that the owls go through when they fly up heavy prey like rabbits or ducks. It takes them multiple stops on ladders on their smokestack or the other two smokestacks nearby, laboring up until they can finally heave the prey into the box for their voracious chicks. I have commented on it before, but I still get a funny mental image of the chicks going through their branching stage, clinging to the perch outside the box or grabbing the ladder 260 feet off the deck. When they finally decide to go for it and fly out, that must be quite the leap of faith. 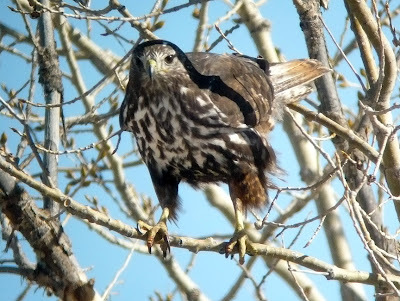 I'm noticing that if a Harlan's Hawk has red in its tail, it is often more extensive in the outer tail feathers, with the gray going farther out in the middle feathers. (By the way, in any RT subspecies the red is mostly on the top of the tail, not the bottom, so from underneath you won't always see it- the bird in this post shows both the underside and top of the tail for comparison. To get the tail lit up red from underneath, the bird usually needs strong light coming from above- see this bird as an example.) 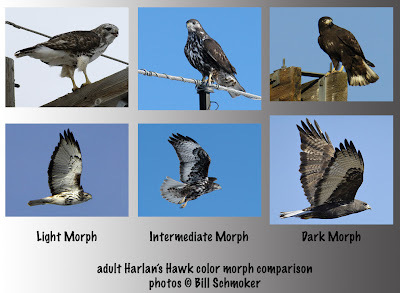 I thought I'd cobble together a little comparative matrix, showing adult light-, intermediate-, and dark-morph Harlan's Hawks perched and in flight. There is essentially an unbroken continuum between the light-morphs and dark-morphs, but I've tried to choose good matches for the end members and a pretty middling intermediate bird. Birds that are more darkish-light, light-intermediate and dark-intermediate, and lightish-dark are out there, too, but I'm not including them in this comparison. You'll note that good, dark Harlan's still have at least a wee bit of white streaking on the breast, something that calurus dark-morphs lack. Also note the cold, blackish steaks on even the light-morph individual, not brownish like on light morphs of other RT subspecies. Maybe I'll do a similar matrix sometime for juveniles, but they largely follow the pattern, differing mainly in eye color and tail pattern. Another bird of note at Cherry Creek has been a juvenile swan. Swans can be deceptively tough to ID when you don't have up-close field guide looks at adults. The open patch of water that has been the base of operations for this bird is about 500 meters out from shore, and often the air gets quite distorted over the ice. As if that wasn't enough of a problem, young swans don't develop some of the most important field marks until they mature- things like the shape of their bill or the shape of the junction with the bill and forehead can be unpredictably out of whack on first-winter birds. 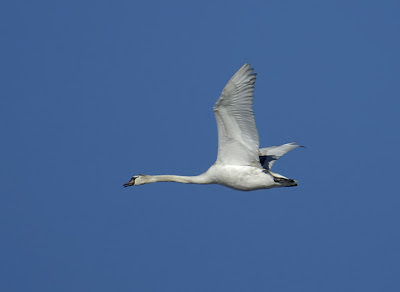 Lots of indicators pointed to Tundra Swan, including black legs and a concave upper bill edge. So for a couple of days, the RBA and state list serve were reporting it as such. 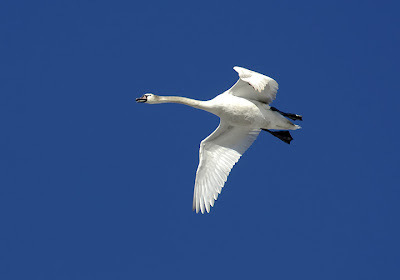 Yesterday, though, a competing ID theory developed with its own supporters pointing out features like the immense size, all-dark lores, and long neck as indicative of Trumpeter Swan. I didn't arrive until about noon, and soon got onto the swan, which was standing near and completely dwarfing a Canada Goose (a large subspecies, too- not a lesser Canada Goose.) The bird stretched, craning its neck, which was amazingly long. Seeing this for myself, and with the arguments for Trumpeter fresh in my mind, I had no problem agreeing with the call- Tundra would be bigger than a Canada Goose but not that big. Throughout much of the afternoon I happily shared my scope with other birders and casual passers-by, telling them it was a young Trumpeter Swan. 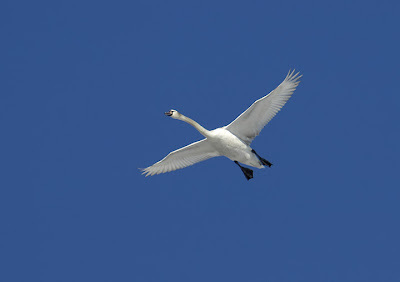 So were the Tundra Swan folks right? Nope. You see, Trumpeter and Tundra Swans are the only species on the state list, and we all fell into the trap of trying to make the bird one or the other. But while I was happily pointing out the bird to folks, Bill Maynard had gone home and was studying his digiscoped pictures to try and settle the issue. His conclusion was that the bird was a young Mute Swan, which explained the seeming contradiction of field marks. 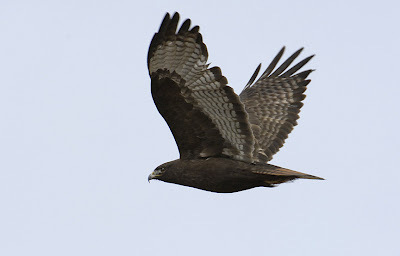 Coincidentally, just after he posted his thoughts to the state list, Mike Freiberg and I were photographing the bird as it flew over us, heading off beyond the dam for about ten minutes before thinking better of the sojourn and flying back to its hangout in the middle of the lake. I didn't look at the photos at all, though, until my dad called me to tell me about Bill Maynard's post. 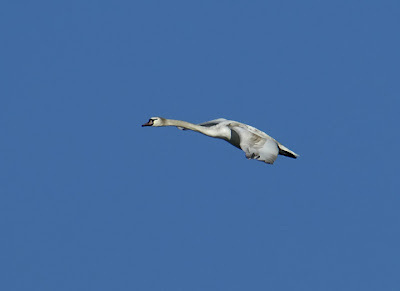 Mike and I grabbed our Nikons and zoomed in on the flight shots, and essentially smacked our foreheads with the realization that it indeed was a Mute Swan. So what are some things that I take away from the experience? • This is an example of why the birding lifestyle is cool- healthy, friendly ID debates and sometimes surprising resolutions. • A great example of seeing what one expects to see instead of seeing what one is actually seeing. • A reminder to keep the mind open to possibilities beyond the expected, particularly when a bird isn't quite "right." So at this point I hand it off to the Colorado Bird Records Committee. I don't think there will be any debate about the ID, but with people around the country keeping Mute Swans in their ponds, the provenance of the bird will be debatable. On the other hand, established wild populations of this Eurasian species exist up and down the East Coast and through the Great Lakes, and perhaps in Missouri and Montana as well, so making the flight to Colorado from one of these wild populations wouldn't be too much of a stretch for such a bird. It doesn't show obvious signs of aviculture (like a band or clipped or oddly worn wing feathers), but not all waterfowl enthusiasts band their birds, I suppose. Whatever the eventual verdict, it is a very interesting bird and sure to generate much more discussion before the whole episode is over. Anyway, Garrett will have to wait for another chance at his ICGU lifer since it didn't show during our time looking. 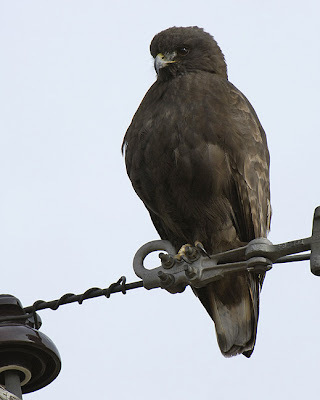 Not all was lost, though, as we found this inky dark-morph calurus Red-tailed Hawk on our way home. It was at the exact same location where I saw it last winter holding court on a power line along 95th and Valmont east of Boulder. 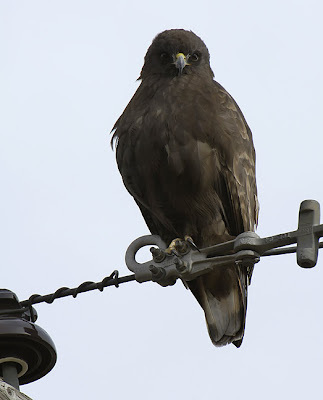 I'm positive it is the same bird, as dark-morph birds like this are really scarce. It would be just too much of a coincidence to have another at the same spot. Needless to say, I was pretty excited to see the bird again- I get pretty geeked about dark buteos (in case you haven't noticed.) My excitement grew when the bird decided to stay put as I pulled off on the shoulder of the road instead of bolting directly away. 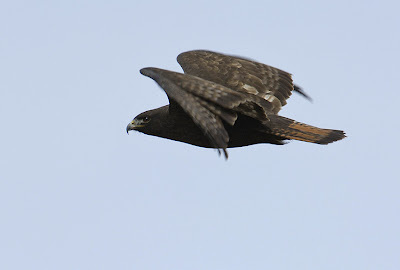 When it finally launched it flew parallel to the road north of me, keeping in good light and in profile. A clear blue sky would have been peachy, but I'm not complaining! I guess this unusual exhibition of cooperation is a bit of payback for all of the birds that fly straight away at their first inkling that I'm slowing down to look at them. I got some shots I really liked of the bird last winter, but this time the light was a lot better for the perched shots, and I got a series of flight shots showing the deep red upper tail surface (aka the deck.) 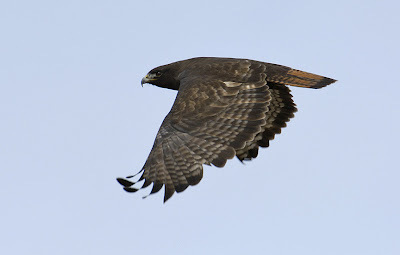 Even really dark Harlan's Red-tailed Hawks wouldn't have a complete red deck like this. Although they can have some red in their tails, if present it is usually near the base and the rest of the deck is banded grayish white. A Harlan's would also have at least a few white streaks on its breast.